When I picture December this year, I imagine newborn toes peeking out from underneath a cozy knit blanket in a room filled with sparkling white twinkle lights, pine & spiced cranberry-scented candles, hot cocoa, and Bing Crosby crooning the classics. The holidays are always magical for me and I can only imagine how much more so this season will be be with a brand new little person to celebrate. For the last several years, I've tried to "shop small" for the majority of my holiday gift-giving. One of my favorite December traditions in New York is strolling through the various holiday pop-up markets around the city searching for the perfect gifts for all of the special people in my life. This year, with baby's due date on Thanksgiving, I'm not sure whether I'll make it out to the markets or not, so I turned to the next best place to find handmade goodies: Etsy, of course. 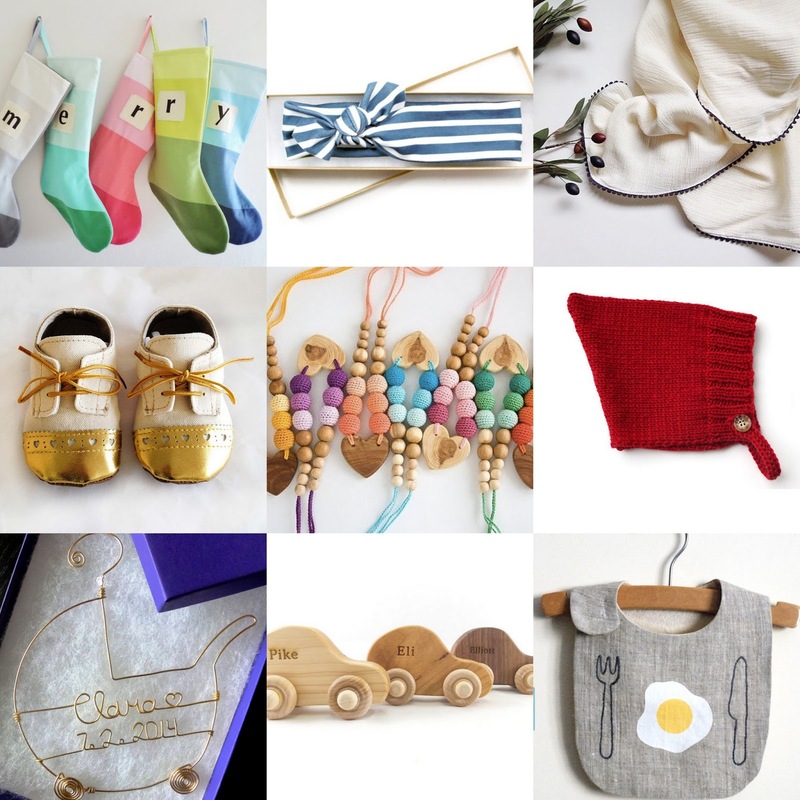 I've bookmarked so many cute shops and products and couldn't help but round up a few personal favorites in celebration of baby's first Christmas (hint, hint to inquiring family members!). Personalized family stockings! I'm thinking this is the perfect year to invest in a coordinating set we'll use for years. For our little family of three, I'm loving the "peppermint pink," "pistachio green" and "sky blue" colors. Little Highbury makes the sweetest knotted baby headbands and hats. I love the navy stripe, pictured. I've already ordered a few items from NomiLu (a beaded pacifier clip and gorgeous scalloped swaddle blanket) so I had to include her shop here because everything is just so well-made. I've linked to Ajolar baby shoes a couple of times before, but I love them that much. The gold & cream version shown above would make the cutest first Christmas accessory. How beautiful are these sweetheart teething/nursing necklaces from Freja Toys? A non-toxic and eco-friendly gift that both mama and baby can enjoy. I have imagined our baby wearing a little pixie hat throughout this entire pregnancy. There are so many great options out there, but I especially adore this festive red knit bonnet from Sweet KM. I feel like it's a huge rite of passage to hang baby's first ornament on the tree. This personalized twisted gold wire carriage is delicate and lovely. Every little one needs a classic wooden car to push around. Bannor Toys can do no wrong in my book with their collection of organic wooden toys and rattles. This "good morning" linen bib from Yoriko New York is both practical AND adorable. Have any can't-miss Etsy shops to share? I love discovering new sources for awesome handmade gifts. Thank you for share your valuable post. I'm just confused if Cover cause it to outside to your sells and also never, thus converted to another most effective method to obtain handmade offerings: Etsy, not surprisingly. I saved as a favorite lots of lovable suppliers plus products and solutions plus weren't able to enable nonetheless locate one or two very own offerings around festivity with small one's initially Christmas time. I've tried to "shop small" for the majority of my holiday gift-giving. Wonderful! I love reading stories like this, you must have been so proud. Hope you're all doing well now!